On the first day of the tour we packed up our custom built vehicles and departed Windhoek early to drive south east towards the border of Namibia and South Africa. Leaving the city on bitumen roads we had a wonderful, bump-free ride until we stopped for fuel at Stampriet. From there we were on dirt roads following one of Namibia’s ancient ephemeral rivers, the Aub, as we drove towards the border of Namibia and South Africa. The first part of drive was dotted with rural holdings that seemed to survived from sunken bores in the river bed. They gradually gave way to more wilderness and as we neared the border we started to see a lot more wildlife including Bat-eared Foxes, some of the more ubiquitous Kalahari raptor species including Pale Chanting Goshawks and Tawny Eagles. We were also lucky to spot our first family of Meerkats that afternoon. Pulling into Torgos camp late in the afternoon we were pleased to find our crew had arrived and were already organising dinner. That night we dined for the first time under the skies of the Kalahari. Early the next morning we crossed the border into South Africa at Mata Mata. Generally this is just a bureaucratic formality but it was one that came with a twist that morning. Basking in the early morning sun was a group of resident Meerkats, who had decided that Mata Mata was a great place to build their labyrinth of burrows. As one of the most iconic animals of the Kalahari, spending time with so many Meerkats early in the morning had us all addicted. Joining us were several Ground Squirrels, Yellow Mongoose, Yellow-billed Hornbills (Flying Bananas). Eventually the Meerkats decided that they needed to go off foraging for the day and so we left them also and drove into the park. Our journey to Nossob would see us travelling through stops that included Sitsas, Urikarus, Dikbaardskolk, Kaspersdraai and finally Nossob. Our first day in the Kgalagadi Transfrontier was spectacular with many Oryx and Springbok seen from the road. We also were blessed with our first sightings of Giraffe, Honey Badger, Wildebeest, more Bat-eared Foxes, Kudu, Lion and, as we approached the camp at sunset , our first Brown Hyena. The birds didn’t disappoint either. We also enjoyed encounters with Swallow-tailed Bee-eaters, Secretarybirds, our first Lilac-breasted Rollers, vultures, African Hoopoes, Kori Bustards, Sociable Weavers, Black-chested Snake Eagles, Ostriches and even some lovely encounters with Southern White-faced Owls and a Spotted Eagle Owl. On our first night in Nossob we had the amazing experience of sleeping in a camp surrounded by roaring lions! So the next morning we went off to try and find them but sadly they were nowhere to be found. Setting off into the park we had rather beautiful views of an Oryx next to the road in the early morning sun. Our first foray looking for lions was unsuccessful so we made a u-turn and decided to try the other side of the camp. We stopped briefly at a waterhole that was known for its congregations of sandgrouse and although we didn’t see as many sandgrouse as we hoped, there were still large flocks of Cape Sparrows whirling in the air and occasionally drinking from the pool. At one point we watched a young Gabar Goshawk trying to hunt some of them on the wing. Further along from the pool we saw our first African Wild Cat hunting for mice in the long grass on the side of the road. We also saw our first Hartebeest during the morning drive. Further into the day some of the highlights included a group of 5 Cheetah walking slowly parallel to the road, a Honey Badger that actually crossed the road in front of us with its cub in its mouth, we found 4 Spotted Hyena under a tree and we ended the day with a group of 3 Lions as we neared the Two Rivers end of the reserve. That night we pulled into a very basic campsite at Two Rivers. Our fourth day in the Kalahari saw us exploring the area around Twee Rivieren in the reserve. We had some wonderful encounters with fighting Ground Squirrels and Black-backed Jackals hunting for mice. We also spotted a distant hunting party that consisted of a Pale Chanting Goshawk, a Black-backed Jackal and a Honey Badger all foraging together on a nearby hill. We also saw our first Cape Fox of the trip. At the end of the morning safari we decided to go back to Twee Rivieren to take a hot shower, do some shopping and take a rest before our afternoon safari. As the light became better we went back out into the park and found a very young baby Oryx following its mother across the countryside but the highlight was a pride of 5 Lions. We stayed with this pride for as long as we could and we watched them sleeping and copulating while we were there. Eventually we had to make our way to the gate for sunset and overnight stay at Two Rivers. The next morning we left Two Rivers and crossed the border back into Namibia, On our drive north to Keetmanshoop. 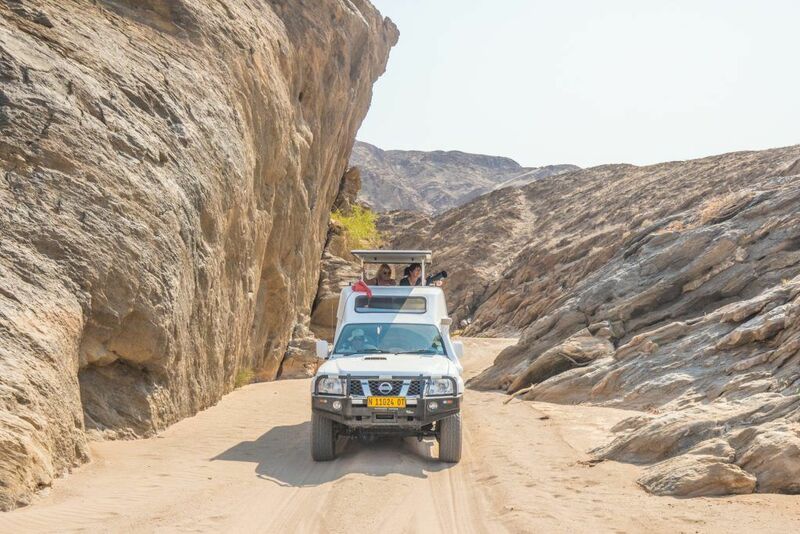 Characterised by an otherworldly combination of stacked dolerite rocks and Namibia’s most famous aloe, the Quiver Tree, the Giant’s Playground and Quiver Tree Forest was our next destination on our journey into Namibia. We arrived at the camp and found our first Rock Hyraxes grazing in the nearby shrubs. After taking a few photos we jumped in the vehicles with our landscape photography equipment and drove over to the beautiful Giant’s Playground for a sunset shoot. It’s always hard not to lose yourself in the Giant’s Playground, not just because of it’s labyrinth of different paths, but because of the amazing amount of photographic opportunities that are in there. We stayed until sunset taking photos of rock stacks, quiver trees, hyraxes, agamids and flowers. The next morning we were up before sunrise to wander through the Quiver Tree forest at dawn for photography. We then packed up our gear and drove a dramatic route from the Kalahari to the Namib further west. The drive from Keetmanshoop to Sesriem saw us stop in Mariental to buy some snacks of biltong to take with us on the road. From there we stopped at a nearby lookout to enjoy a lunch before driving further west. We dropped into a spectacular canyon near Maltahohe and drove out on to the plains towards Sesriem, spotting our first Burchell’s Zebras on the way. Arriving at Sesriem we checked in to the spectacular Sossus Dune Lodge, the only lodge within the Sossusvlei Park and at sunset, we drove Peter, Margaret and Diana out to the helipad to do their aerial flight over this incredible dune system. While they flew the rest of the group went to Elim Dune to catch the last light on this spectacular park and search for wildlife. The next morning we rose early and left in the dark to drive out to Deadvlei, possibly one of the most iconic destinations in all of Africa. 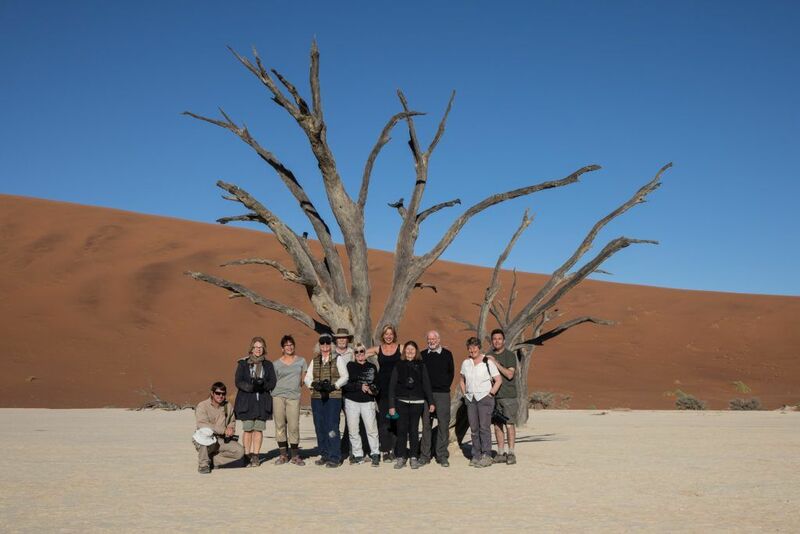 An ancient clay pan dotted with numerous dead camel thorn trees, Deadvlei is starkly beautiful. We trekked over the dunes to arrive there at first light then spent a couple of hours photographing individual trees, groups of trees, practicing starbursts at smaller apertures and also taking group photos before we return to the lodge for lunch and a siesta. Later that afternoon Julie, Jodie and Andy went off on a scenic flight while Julie, Kris and Di joined Sean and Inger in the dunes for some landscape photography. Initially a sandstorm looked a bit ominous as it came down the valley from the direction of Deadvlei but we played the storm to our advantage and took some beautiful silhouetted tree shots in the misty light. We ventured out as far as the famous Dune 45 but had to turn back so we could reach the lodge by sunset. On the way, we were trapped for a short time in our first “Oryx jam” as we waited for seven Oryx to cross the road. Noting they were heading towards a red dune backdrop we stopped to take some beautiful images of them moving across the landscape in the last light of day. Our final day in Sossusvlei saw Kris, Julie and Graham take off over the dunes for their scenic flight while the rest of the group rested at the lodge. We then packed the vehicles up and drove the rough road to Swakopmund via the quirky stopover hamlet of Solitaire with its collection of old vehicles. 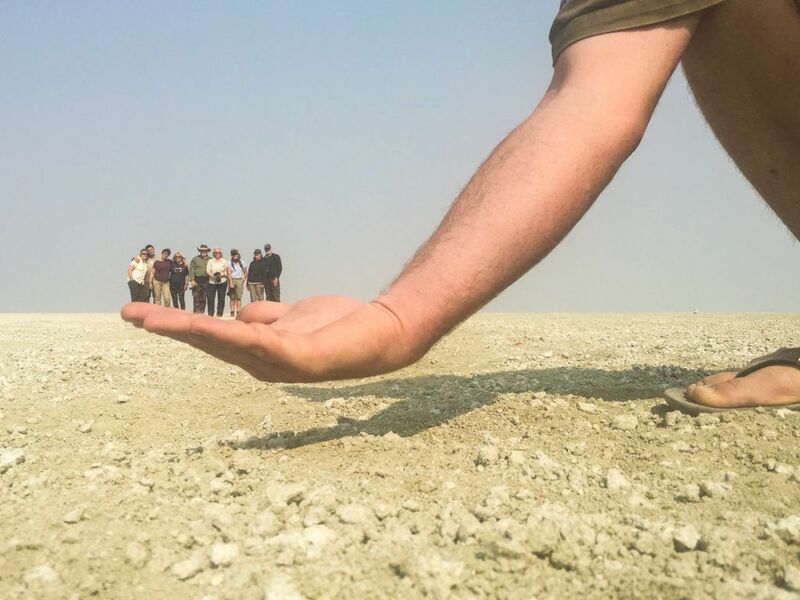 Highlights of the drive towards Swakopmund included a stop for a group photo when we crossed over the Tropic of Capricorn and a detour to the Welwitschia Plains to view some of the oldest plants in the world. Arriving in Swakopmund we checked in to the Delight Hotel and enjoyed a wonderful meal at The Tug. The next morning the group was collected by Sean’s brother Dayne, to go off on a Living Desert tour searching for some of the smaller creatures of Namibia’s dune systems in Dorrob National Park. On a trip where we saw everything a system like this could offer it was hard to name the highlights. We saw a Namaqua Chameleon hiding in the Dollarbush, a very tame Palmato Gecko with its large eyes and webbed feet for digging in the sand, Shovel-nosed Lizards, feeding Trac Trac Chats, a scorpion and some incredible encounters with Horned Vipers and Peringuey’s Adders. We also learned a lot about the formation of the dunes on the Skeleton Coast and some of the minerals that can be found in them. After the tour concluded we returned to Swakopmund for lunch and some shopping before we drove north to Cape Cross via the flamingo flocks at the saltworks north of Swakopmund and the shipwreck of the trawler “Zeila”. We arrived at the beautiful lodge of Cape Cross in the late afternoon and enjoyed a small rest before dinner. Sadly we were visiting the gargantuan African Fur Seal colony at Cape Cross during the culling season so the reserve didn’t open until 10am so we had a little time to check out some of the 37 endemic local lichens in a fenced off area beside the road. These lichens are a bridge between funghi and algae and they are a key indicator species of air quality. When the gates opened to the reserve we collected the young boy who had been sent down to open them from the information centre, and we gave him a lift back to the same. Driving from the centre to the reserve we saw a couple of Black-backed Jackals wandering around at the back of the beach. The stench of Africa’s largest Fur Seal colony greeted us before we could see it and we spent a couple of hours wandering around the boardwalks watching the myriad of activities of thousands of African Fur Seals. After we left Cape Cross we drove north along the Skeleton Coast, past Terrace Bay up to the incredible Torra Conservancy. We made a brief stop en-route to look at some migrating Humpback Whales but they were some distance from the shore. As we approached the Torra, we left behind the silvery grey landscapes of the Skeleton Coast and found ourselves immersed in a sea or terracotta. After entering the conservancy through a checkpoint, we stopped on the side of the road for lunch. Dotting the red granite landscape were more, and larger, Welwitshcias than we’d actually seen on the Welwitschia Plains near Swakopmund. Driving further from our lunch spot we made a small detour to visit some ancient Damaraland petroglyphs. Desert Rhinoceras had been present at the site but sadly we never saw any the day we visited. We saw and smelled our first Commiphora Bush, the bush that Himba women use to burn in Otjize to fragrance their bodies. Before we ended the day we stopped by a lookout that had the most amazing views over the Palmwag Conservancy below us. We arrived at the oasis-like Palmwag Lodge which was dotted with Makalani Palms and green shrubs, a small verdant patch in this vast red landscape. Over dinner we were entertained by the lodge staff singing in their choir and then the staff approached our table quietly – a desert elephant that frequented the lodge had turned up in the lodge car park! We crept outside to see our first wild elephant in Africa and a rare desert-adapted elephant no less! What an amazing way to end a spectacular day! The next day we ventured out for a full day of low range 4WD touring in the Palmwag Concession looking for desert wildlife. After a lot of driving and searching for wildlife, the morning produced few creatures except for the occasional Giraffe and Oryx. We stopped at a registered site called C1 for lunch and sat in the shade of a large Ironwood tree (Ombuborombonga in Otjiherero) and we also started to see some of the beautiful endemic flora of Damaraland including the Pachypodium liliana (Bottle Trees) and Euphorbia damarana (Damara Euphorbia). After lunch Sean managed to find a solo desert-adapted Rhinoceros in the concession. Although it was distant, we all marvelled at how he found this animal in such a vast landscape. We tried numerous different ways to get closer to this animal and we managed to get some reasonable distant shots but the heat shimmer of the early afternoon started to get the better of us so we started to make our way out of the Palmwag Concession. On the way we met a group of three rangers in the Concession’s anti-poach unit who we chatted to and who were interested in our sighting. Then finally we had a lovely encounter with a dazzle of 7 Hartmann’s Mountain Zebras before we drove out to Khowarib Lodge near Sesfontein, stopping only to photograph a really old Giraffe on the side of the road. Namibia’s coastal, ephemeral rivers represent some of the last great wilderness areas in southern Africa. Today we explored the first of these looking for desert adapted elephants and lions. As the dusty plains of the river terminus gave way to the gates, we stopped to chat to the guards who kindly let us through. Suddenly we found ourselves driving through a river bed dotted with stands of vegetation and small pools. At one point Inger and Sean took a slightly wrong path and tried to mount one of the sandy river banks. After a couple of attempts Inger got bogged trying to get up it so everyone had to get out and pitch in to dig her out. Backtracking along the river bed, we found the correct path and drove further up the river. It really felt like a true oasis in the desert as we passed by many large trees and stands of vegetation. We found a few Giraffes and many species of birds including Egyptian Geese, Blacksmith Lapwings and Ostriches. We also saw herds of Springbok. Then, further up we found them – a herd of 17 Desert-adapted Elephants including two babies. We stayed with them for as long as they allowed us, gently driving and stopping up the river in different places to take photographs and give them space. It was wonderful to see them engaging with each other and stopping to eat vegetation as they ambled up the Hoanib River bed. At one point we stopped well clear of their path and were stunned when we were approached twice by two separate elephants. The first one came right up to Inger’s car and was literally centimetres away from her guests. The second one approached Sean’s car and gently investigated what was happening in it with her trunk! These encounters floored all of us. We hadn’t driven into their path, these elephants simply chose to engage with us on their own terms. Stunned, we decided to leave them alone and enjoy a lunch in the shade of some nearby trees. While we did, we looked at other things like birds and an unusual bi-coloured Tok Tokkie Beetle. Finally we drove out of the river through massive pits of bull dust back to the lodge where we enjoyed pre-dinner drinks around the boma and recapped on our day. When we found out that Sesfontein had run out of fuel we departed Khowarib early for a long day drive to Opuwo then up to Etaambura in remote Kaokoland. Considered as the Himba capital of Namibia, Opuwo bustles with people of all kinds including Himbas, Hereros, Zembas and tourists. Stopping there allowed us all to meet some of the local people, their children who were on school holidays and a few Zemba girls plying their trade of bangles and jewellery. We also needed this important stop to refuel and check our tyres before the long, rough drive out to Etaambura in remote Kaokoland. The drive out to the lodge was long and rough, yet spectacular. We saw a Hartmann’s Mountain Zebra high on the ridge on the way out and as we crossed an expanse of grasslands, we saw a large herd of Springbok and an unusually large flock of Ludwig’s Bustards feeding on the plains. Arriving at the lodge, we enjoyed sundowners on their elevated deck surrounded by the stupendous views of this incredible corner of Kaokoland at sunset. The next morning we split into two groups for nature/birding and also people photography. The nature photographers went off to visit the local disused marble mine while the others went to spend time with the local Himba people. In the afternoon the groups were switched. Together, we visited a local Himba graveyard and also a communal well which had been dug to water livestock and also for the families of the area to collect drinking water. It was a fascinating insight into the culture of these red ochre people of the desert, led by our anthropological guide and translator, Henry. At Etaambura and in the surrounding areas we had some wonderful encounters with African Peach-faced Parrots, Ruppell’s Parakeets, Monteiro’s Hornbills and even a Yellow-tailed Woodpecker! We left the area of Etaambura early the following morning to drive to Purros and on our way out we had some surprising and lovely encounters with quite a few Giraffe in the early morning light. It was a wonderful morning to get photographs of these graceful creatures as the light was perfect. Driving further on, the landscape turned into rocky plains and hillsides, with sparse vegetation as we drove out to the isolated community of Orupembe. We then turned to follow a corrugated road that ran parallel to the Skeleton Coast, south towards Purros. The area was dotted with a number of wild rock sculptures by Trevor Knott, the architect of Etaambura Lodge, so we stopped to photograph a few of these and also to take shots of a small herd of Oryx near Orupembe. Driving south along the road we also stopped to photograph the incredibly vast landscapes of flat, open plains, mountains disappearing by mirages and also the fringing coastal fog from the Skeleton Coast. The next settlement we would see would be the dusty Himba town of Purros. At first sight Purros seemed to be another real outpost. Only slightly larger than Orupembe, Purros sits on the side of the mighty Hoaraseb, another one of Namibia’s ephemeral coastal rivers. We negotiated a variety of tracks through the river bed and found our way around several Giraffe, Ruppell’s Koorhan plus a Black-backed Jackal to find the lodge hidden away in the river bed. Checking in we realised it was pretty basic but it formed the perfect base for our afternoon exploration of the Hoaraseb River to look for more desert-adapted wildlife. The drive into the river was incredible with some very narrow gaps in the mountains to travel through, troupes of Chacma Baboons, Oryx, Springbok, Egyptian Geese, Three-banded Plovers and Cape Wagtails. While we didn’t see any elephants, we did find some of their tracks and backtracking out of the river, we drove up to a nearby promontory for one of the most spectacular sundowner sessions of the trip so far. The next morning we left Purros at first light for the long drive to Etosha via Palmwag, Sesfontein and Kamanjab. It was on this drive that we met our first Mukwana women from Angola, selling some jewellery with some Himba women at the gates of the Palmwag Concession. Ethnically Mukawana people follow similar traditions as the Himba in that they are semi-nomadic pastoralists, but their appearance is starkly different with their ash coloured buttered hair and brightly coloured jewellery. 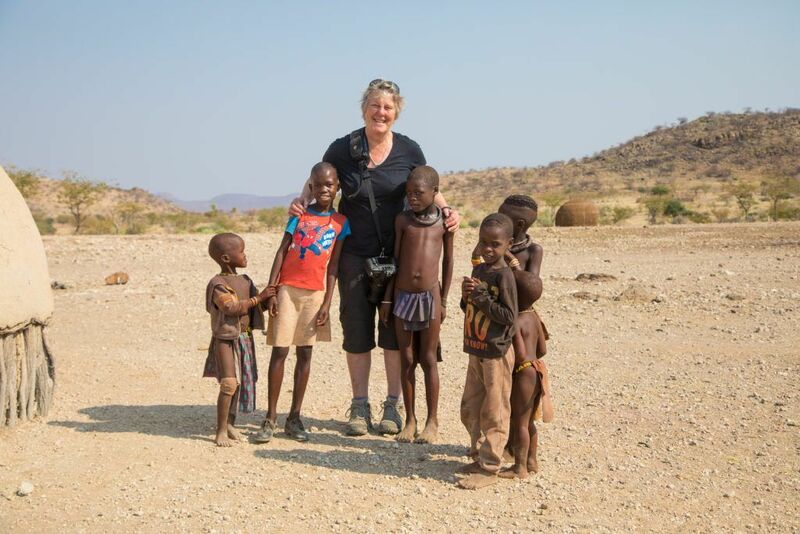 After we drove over the Grootberg Pass, we made a stop at Kamanjab to refuel our vehicles then drove further to the western end of Etosha, entering the reserve at the Galton Gate. Our support crew had gone on further to set up camp in Olifantsrus. The game viewing started as soon as we left the park gate offices. We found a dead Eland but sadly there was nothing on it. Driving slowly into the park we saw giraffes, Oryx, Springbok, our first Burchell’s Zebras of the trip, a Damara Dik-dik, Ostriches, Guinea Fowl. Black-faced Impala, Kori Bustards, Pale Chanting Goshawks, distant nesting Secretarybirds in a tree, Tawny Eagles and mixed flocks of Sandgrouse. Our second day in Etosha started with a slow drive from Olifantsrus to Okaukuejo. As we left Olifantsrus we saw a Brown Hyena on the road and we also enjoyed an encounter with a pair of Ostrich parents and their chicks. Before we even arrived there, we heard the melee of calls. Around 3 kilometres from the Ozonjuitji M’Bari waterhole we started to hear the whinnying of many zebras and we saw three large Etosha elephants crossing the road near us to head towards them. We drove around to the waterhole to find it teeming with wildlife in one of the most incredible wildlife spectacles that Etosha can put on. Gathered around the waterhole were over five hundred zebra, three elephants, around six hundred or so springbok, one Black Rhinoceros, one Black-backed Jackal chasing all sorts of creatures away from the waterhole, around 45 Wildebeest, 3 Steinbok, Ground Squirrels and Kudu. It was such a mesmerising scene watching the Elephants bathe, the zebras fight with each other and the rhinoceros clearing a path through all of them so he could have his turn at drinking from the waterhole. None of us wanted to leave. The photographic opportunities at this waterhole were so spectacular, only hunger drove us to leave in the end. Stopping for a snack at a fenced off area, we did a circular route from the rest stop to our final camp of the day – Okaukuejo. On the circular drive we found some more lions in two different locations and saw our first glimpse of the vast Etosha Pan. We initially thought we would go out for a late afternoon drive from Okaukuejo but instead we all settled in and enjoyed a shower and camp dinner, enthralled at the experiences our first full day in Etosha had given us. The third leg of our days in Etosha saw us driving from Okaukuejo to Namutoni and as we drove out of the camp at sunrise, we were pleasantly surprised to find a collared Spotted Hyena mother nurturing her solo cub on a nearby pan. We stopped to get some photos of her suckling her cub until they both rose to face the day and sauntered off. Heading out towards Gemsbokflakte we stopped to photograph a pair of Northern Black Koorhans and listen to them call. If we thought the day was going to be quiet out on the plains, that all changed when we drove down to a pretty waterhole called Salvadora, on the edge of the Etosha Pan. There we were quite literally dazzled by hundreds of Burchell’s Zebras, almost a hundred Wildebeest and many, many Springbok. Mesmerised by another beautiful Etosha scene we took photos of the movements of these animals, including some beautiful shots of zebras in the savannah grasses. We toyed with leaving but then we spotted three lionesses heading towards the mass of wildlife. Sadly they were just looking for a place to rest so we decided to leave and make our way towards Halali Camp. As we drove away from Salvadora, we saw two large Etosha Elephants ambling slowly towards the main road so we went over to look at them and had them both directly approach our cars! Once again we were amazed to be inspected by these, some of Africa’s largest elephants. We stopped by another waterhole before going to Halali called Rietfontein where we saw around 25 female Kudus, 20 Hartebeest, another Elephant, more Zebras and Springbok. Checking in to Halali, we enjoyed a rest before we went back out in to the reserve. We drove slowly back towards Salvadora, through a few “zebra jams” and tried to see if the lionesses we’d seen earlier that day were up to anything but sadly they were still asleep. Another two had joined them so now there was a pride of five very lazy lions. The camp closing time called us so we drove back out to Halali viewing a distant Elephant and another distant Black Rhinoceros on the way. The next day was our final full day in Etosha and we left Halali at sunrise. We made a brief stop at a waterhole called Goas but it was quite quiet there with very few mammals and only Hartlaub’s Francolins to entertain us. Leaving Goas we drove towards the pan and found ourselves in the middle of a feeding herd of Elephants with lots of youngsters and babies amongst them. We stayed with them for a while and as we drove off we saw a walking Black Rhinoceros some distance from the road. Sean that he might head for a waterhole so we tried to go down and find him without any luck. We drove out towards the pan and then we saw them. At first it looked like a wall of Elephants coming towards us but it was a steady group of 7 large Etosha Elephant bulls heading straight towards us! We stopped to wait for them and made space for them between our vehicles. Suddenly we were faced with a wall of elephants! It was incredible to see the size of these elephants in comparison to other elephants we’d seen on the trip and we were amused to watch the last elephant pause because he wasn’t sure if he could cross the road, then quickly bolt across the gap between our two vehicles. We let them pass then we drove on to Namutoni to check in, have lunch and a swim before going back out in to the park again in the afternoon. While we were swimming a few of us were amused to see another large elephant looking longingly at the swimming pool from the fence around the camp! Later that day we went on our final safari in Etosha and the highlights included a very cooperative Lilac-breasted Roller catching grasshoppers and tossing them in the air before he ate them. We then went out to Two Palms and found some wonderful backlit Wildebeest as the sun got lower in the sky. Lastly we checked out Dik-dik Drive to see if we could spot any leopards but instead we had some lovely encounters with tiny Damara Dik-diks. At the very last light of day we stopped at Klein Namutoni where we saw a small herd of elephants swimming and playing in the water. When they left the waterhole, they went over to a nearby dust pit to dust bath in what turned out to be the ultimate dust and powder session! That night we dined under the stars as a blood moon rose behind the camp. On our final full day in Namibia we drove from Namutoni via Tsumeb, Otjiwarongo and Okahandja back to Windhoek for our final dinner of the tour.